Paula Henderson, Border Patrol, 2006. Courtesy Linda Warren Gallery, Chicago. CHICAGO.-Basketball courts on canvas are the focus of the next UBS 12 x 12: New Artists/New Work at the Museum of Contemporary Art (MCA), Chicago. Paula Henderson presents six large abstract paintings of basketball courts commenting on the relationship between sports and contemporary social behavior. Hendersons exhibition opens at First Fridays and is on view January 5 - 27, 2008. The paintings evoke the look of tapestries and repeat the colorful lines that divide basketball courts into zones of play. 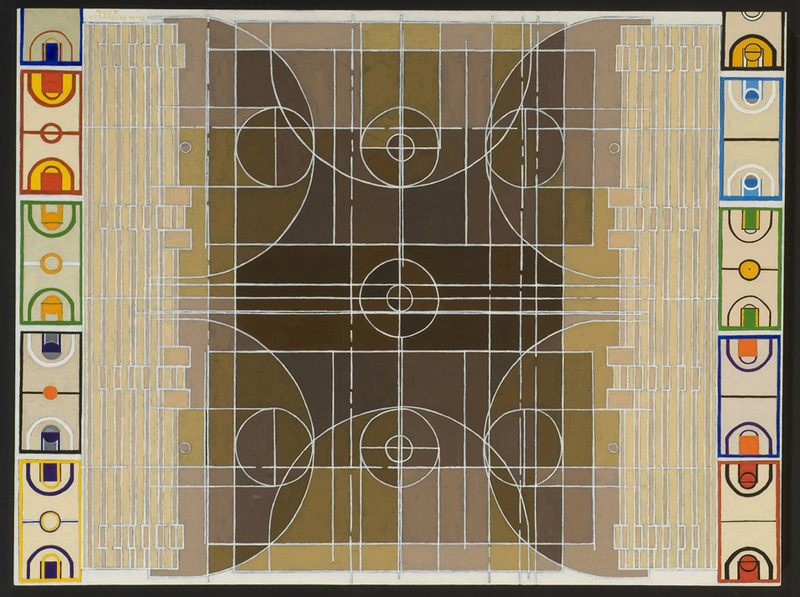 Henderson models her work after the layout of school gymnasium basketball courts and professional NBA courts to examine the relationship between the business of sports and the locales from which players are drawn. Hendersons intricate forms and patterns may question the use of professional sports as a social and racial dynamic, as well as their ability to both fix and limit social perceptions of one another. Henderson received her BFA at the University of Massachusetts and her MFA from the University of Chicago in 2004. Henderson currently teaches at the School of the Art Institute. She leads a tour of the exhibition on Tuesday, January 15, at 6:30 pm. First Fridays Fallen Star theme features an Argo Tea sample station; the G5 iMac digital dating bar; Macys Members Lounge; and DJ Daniel Mnookin kicks off the new year with high-energy music. The afterparty takes place at Bon V (1100 W. Randolph St). First Fridays tickets include museum admission and complimentary Pucks hors doeuvres, and are available the evening of the event for $15 ($7 for MCA members). Advance tickets are $10 ($7 MCA members) available through the MCA Box Office at 312.397.4010 or www.mcachicago.org. Doors are open from 6-10 pm. A cash bar is open until 9:30 pm. Guests must be 21 or older to enter.